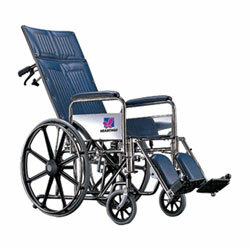 Full reclining wheelchairs, the back can be reclined with a minimun of effort allowing adjustment from the upright position to the horizontal position by means of two maglock cylinders. A removable head support is also supplied. Supplied with 8" solid front castors and 24" solid mag wheels.